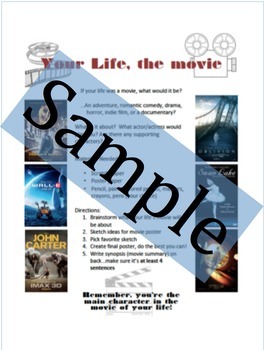 Students get to create a movie poster based on their life, hobbies, or self! This is one of my get-to-know you projects for Art Foundations (though it can be used in any 2D or graphic/digital design class. I not only learn something about my students, but I also get an idea of their skill levels as artists. You choose the paper size/color for the final poster. You can limit mediums or allow students to choose. You can also decide on the amount of time you give students on this. I usually do 2-4, 45 minute class periods. This is a visually appealing handout that includes the prompt and directions for this project.